Senator Dino Melaye, has exposed another massive corruption that is currently ongoing under President Muhammadu Buhari’s watch. Dino alleged that the Nigerian National Petroleum Corporation, NNPC, is operating an illegal account with Keystone Bank, with a current balance of $137 million. 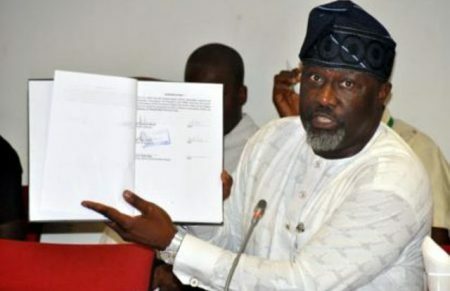 Melaye who raised a point of order during Tuesday’s plenary, disclosed that the NNPC domiciled the Brass LNG Ltd, Joint Venture Company, JVC, account at Keystone Bank, instead of the Central Bank of Nigeria, CBN, as required by the law. “While some individuals and Government appointees will continue to steal, we have decided to continue to expose corruption in public life. I call the attention of the Nigerian Senate to a suspected, colossal, monumental corruption in NNPC. “A company was registered with the name ‘Brass LNG Limited’, with the Federal Government having controlling shares. We have some Italians, Belgians, and French, as shareholders with the Federal Government, with a controlling share of about 50 percent. “It is a known fact that once you have a joint venture, the account of such joint venture will be domiciled with the Central Bank of Nigeria. But in this case, that was not what happened. In private, the account was opened with Keystone Bank; this account has no BVN, and there have been periodic withdrawals. “The last withdrawal from the account was to the tune of $4 million. As I speak to you, the balance of that account as of today is $137 million”, he alarmed.